Can a hazelnut spread sustain a standalone restaurant? On the Mag Mile it can. Swarms of Nutella fans lined up for the opening of America's first Nutella Cafe on Michigan Avenue on May 31. The all-day restaurant dishes up sandwiches, crêpes, gelato, baked goods and coffee drinks. Nutella Cafe, 189 N. Michigan Ave., Chicago, IL 60601, 312-729-5186. Two French concepts — Margeaux Brasserie and Petit Margeaux — make their home in Waldorf Astoria Chicago, with chef-restaurateur Michael Mina as top toque and Brent Balika, formerly of The Dawson, as executive chef. The menu for the former favors Midwestern ingredients while staying true to French classics, and includes porclette cassoulet, escargot bordelaise and frog legs à la Trois Gros. Margeaux Brasserie & Petit Margeaux, Waldorf Astoria Chicago, 11 E. Walton Pl., Chicago, IL 60611, 312-625-1324. 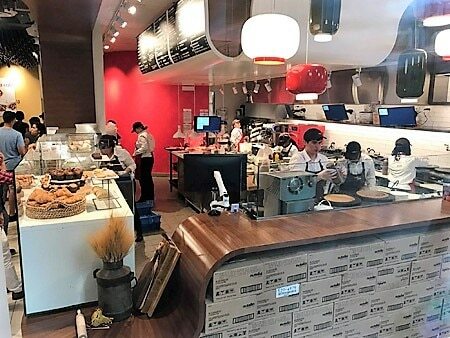 Korean-inspired fare gets the fast-casual treatment at KorFusion in Lincoln Park. With a name befitting its cuisine, this quick-service concept marries traditional Korean recipes with American and other influences. Belly up to the counter for customizable bao tacos, mandu (pot stickers), burritos, tacos, rice bowls, bibimbap, kimchi fried rice and jap chae (traditional Korean glass noodles). Communal dining, delivery and takeout are available. Lunch & Dinner daily. KorFusion, 1234 N. Halsted St., Chicago, IL 60642, 312-929-3166. Ogilvie commuters rejoice: There's a new, larger stall for your poke cravings inside the Chicago French Market. Aloha Poke quadruples the size of its former location to serve the fresh, made-to-order raw fish bowls for takeout or dine-in. This is one of four outposts, with more planned. Aloha Poke, 131 N. Clinton St., Chicago, IL 60661, 312-285-2887. Open since February 2017, Rhyme or Reason keeps retro fresh with its old-school fare and soulful jams. Look for weekend brunch classics such as country-fried steak sandwiches and deviled eggs to wash down with fresh punch and house micheladas. Lunch and dinner options keep playful notes. Live music takes center stage on weekends, whether that's a DJ spinning vinyl or vocalists. Rhyme or Reason, 1938 W. Division St., Chicago, IL 60622, 773-687-8240. River Northers head up to rooftop lounge Apogee at Dana Hotel & Spa for large format cocktails from the team at The Fifty/50 Restaurant Group. The bar specializes in drinks for four to six guests. From the Panda Party (Blackstrap Rum, Cognac, lime, ginger and absinthe garnished with dehydrated citrus, pineapple leaves, orange powder, mint powder and sesame seeds) to the Surtur (Rye, a five-year-aged dark rum, Falernum, lime, grapefruit and Demerara syrup accented with Manhattan marshmallow), expect plenty of drama and flavor. Apogee, Dana Hotel & Spa, 2 W. Erie St., Chicago, IL 60654, 312-202-6000. Rooftop poolside lounge Cabana Club has launched at The Robey hotel in Wicker Park. Exuding a vacation vibe, the bar overlooks the Chicago skyline and the bustling Damen, North and Milwaukee cross streets below. Swimming is limited to hotel guests, but others can dine on small plates and drink Mexican-themed cocktails. Expect dishes such as tostadas with shrimp, tuna, octopus and chicken, and hand-held skewers and fresh vegetable crudité, plus white wine, rosé, and Mexican and local beer. Cabana Club, The Robey, 1616 N. Milwaukee Ave., Chicago, IL 60647, 872-315-3083. No, there's no rabbit on the menu --- although that would be ironic. Filling a void on the west side of Division Street, Clever Rabbit focuses on fresh, seasonal vegetables and sustainable meat and seafood divided into four sections: salads, vegetables, plates and for the table. Fresh juices are the secret to house cocktails, including the salt-rimmed carrot margarita with sage. Clever Rabbit, 2015 W. Division St., Chicago, IL 60622, 773-697-8711. The Talbott Hotel experienced a renovation, and welcomes 20 East to its ground floor. All-day dining is offered; look for sandwiches, large plates, specials and more. The bar features wine, craft beer and cocktails such as the Aperol Spritz with Aperol, lemon and Prosecco; and the Lillet Rosé Martini with vodka, Lillet Rosé, St-Germain and lemon. 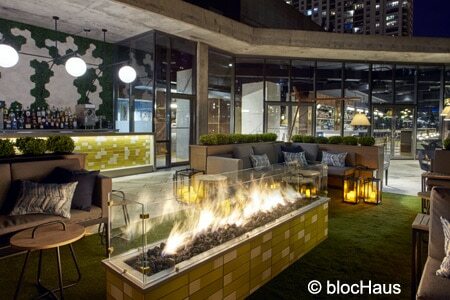 20 East, The Talbott Hotel, 20 E. Delaware Pl., Chicago, IL 60611, 312-944-4970. Whether they are indulging in the signature Chicago-style hot dog or creamy chocolate cake, Chicagoans like Portillo's. It’s an institution, and now a fast-casual phenom in 40 states. The restaurant has decided to resurrect the once-discontinued lemon cake from June 13 to July 31. A select number of outposts will serve the cake by the slice and whole as a test to see whether it should be added nationwide. Lunch & Dinner daily. Portillo's, 100 W. Ontario St., Chicago, IL 60654, 312-587-8910. Primehouse might be known for its dry-aged cuts, but from June 30 to July 2, diners will get a taste of its sweeter side during its first Freeze Pop and Candy Shop Pop-Up. Hosted on the patio, the event will benefit Alex's Lemonade Stand Foundation. The celebration opens with a boozy Strawberry Rosé freeze pop, available during happy hour from 4 p.m. to 6 p.m. On Saturday and Sunday, enjoy the Fizzy Lemon Lime and Blackberry Creamsicle freeze pops from noon to 2 p.m. Primehouse, The JAMES, 616 N. Rush St., Chicago, IL 60611, 312-660-6000. Michael Jordan's Steak House has released The Captain's List, a bounty of prime cuts, to celebrate National Steak Month in June. Choose from selections such as the Tomahawk, a 36-ounce Slagel Farms 45-day dry-aged steak; The Cowgirl, an Iowa premium, 18-ounce 30-day dry-aged steak; or the Chef's Beef Tasting, a sample of four four-ounce cuts including the American Wagyu striploin; a bone-in Linz Heritage Angus beef tenderloin; a USDA Prime wet-aged New York strip; or a 45-day dry-aged Linz Heritage Angus rib-eye ($110). Michael Jordan's Steak House, InterContinental Chicago Magnificent Mile, 505 N. Michigan Ave., Chicago, IL 60611, 312-321-8823. The popular Backyard BBQ Series returns to BellyQ on June 11th. Join guest chefs who will lend their sizzling skills for a full cookout experience from 1 p.m. to 4 p.m. First up are chef Cameron Waron of Honey Butter Fried Chicken; chef Cedric Harden of River Roast; chef Will Bravo of XOCO; and chef Sarah Maun of Urbanbelly Wicker Park. Purchase tickets ($45 each) here. BellyQ, 1400 W. Randolph St., Chicago, IL 60607, 312-563-1010. Arun's, a standard for Thai cuisine, introduces an immersive, educational experience via its Best of Thailand Monthly Dining Series. For two days each month starting June 21, 2017, diners can sample a themed, 10- to 12-course prix-fixe menu for $150 conceived by chef Arun Sampanthavivat, who has been at the helm for 32 years. The series follows this schedule: June 21-22, Regional Thai Cuisine; July 19-20, Vegetarian Thai; August 23-24, Marriage from Heaven, Wine and Food pairings; September 20-21, War of Thai Chili Dips; October 18-19, Thai Pasta; November 15-16, Thai Curry Night; December 13-14, Thai Comfort Food, Braised Better. Arun's, 4156 N. Kedzie Ave., Chicago, IL 60618, 773-539-1909. Working directly with The Barn’s executive chef Nicole Pederson, new chef de cuisine Amanda Barnes arrives just in time to launch the restaurant’s updated menu, outdoor garden and expanded dinner service (nightly) starting in June. With a decade of experience, Barnes will roll out dishes including burrata di bufala with tomato toast, crab spaghetti and seared halibut filet. The garden seats 48. The Barn, 1016 Church St., Evanston, IL 60201, 847-868-8041. Angelina Bastidas, the youngest person ever to compete on “Top Chef,” is the new executive chef of Bin 36. She has created a menu that complements the core components of the restaurant: wine and cheese. Expect dishes such as miso-glazed wings, pork cheek meatballs and shrimp ravioli. Bastidas was formerly the executive chef of AMK Kitchen Bar. Bin 36, 161 N. Jefferson St., Chicago, IL 60661, 312-995-6560. David Fingerman is now the chef of Atwood, located in The Alise Chicago, formerly Hotel Burnham, in the historic Reliance Building. He has unveiled a seasonal menu showcasing dishes such as chicken liver toast, spoonbread, and crispy skinned salmon paired with melted leeks and celery root purée. Fingerman was previously executive chef at Graham Elliot Bistro, and also held that position at Madrina in Dallas. Atwood, The Alise Chicago, 1 W. Washington St., Chicago, IL 60602, 312-368-1900. Cuban-focused restaurant La Havana Cafe (2525 W. Division St., Chicago) has shut down after more than a year in operation in Humboldt Park. La Havana Cafe, 2525 W. Division St., Chicago, IL 60622, no phone.